In the early 1600s Galileo's views that the earth revolved around the sun were challenged by astronomers. There was a formal inquisition and it was concluded that Galileo's arguments could only be presented as conjecture. In what was considered an act of heresy, Galileo later published his views, which many believed to be an attack on Pope Urban VIII. Galileo was tried, and spent the remainder of his life under house arrest. Fast forward to present day in Gary Grossman's geological thriller Old Earth . . . Dr. Quinn McCauley, a professor of paleontology, along with a team of his top students, are on a dig in Montana where they hope to find some rare dinosaur bones. Instead, they unearth an artifact which defies common logic and challenges Galileo's story as told by historians. McCauley and a trusted colleague are determined to reveal the truth behind their discovery of this centuries' old conspiracy. But members of a secret society are bent on keeping the world from learning the truth behind Galileo's discovery. 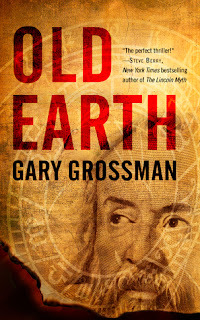 Gary Grossman has authored a gripping thriller which challenges the dogmas of faith and science as they pertain to a world historical viewpoint. With a fascinating premise and cerebral substratum, this book keeps a steady pace as the author skillfully vacillates between the past and present while challenging long held beliefs within the pages of this compelling novel.